The Rocket Plume Flowfield Module (RPFM), software package applies the highest fidelity numerical procedures and physical modeling to plume flow phenomenology. Accurate predictions of plumes can be significant in the development of systems for missile launch detection, typing, tracking, and aim-point selection algorithms critical in hardware-in-the-loop testing. RPFM utilizes the entire feature set available within the CRAFT CFD® flow solver developed over countless man-hours of plume flow modeling research. An Expert Interface (EI) is included by packaging this capability within a simple intuitive interface requiring little to no computational fluid dynamics (CFD) knowledge, making it possible to obtain high-fidelity, CFD flow solutions for realistic missile geometries on trajectories from sea-level to 250km in altitude. 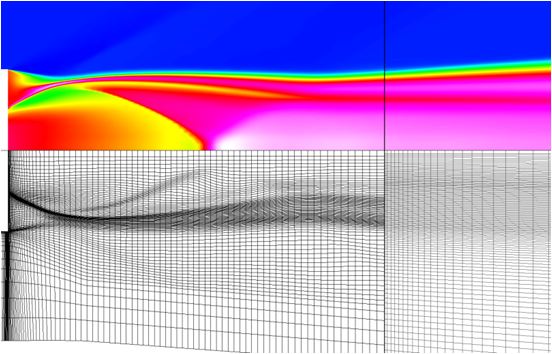 Over 100km, a unique grid generation methodology can be applied that adds grid “shells” to the domain to capture large expanding plumes, or the continuum near-field solution can be automatically interfaced to an appropriate non-continuum flow solver using the Automatic Efficient Generalized Interfaces Surface (AEGIS) Toolkit. The RPFM EI utilizes a tab format that allows the user to quickly switch between multiple trajectory points for case modification, while also providing the user with live status updates for each trajectory point simulation. For even greater ease of use, within the software package is a trajectory setup feature that allows the user to provide each trajectory point’s altitude and velocity, or mach number, which the RPFM EI will use to initialize the entire trajectory tab structure in seconds. Within a few button clicks the entire trajectory can be setup and running so that even a novice CFD user can produce desired plume flowfields for analysis. Upon completion of the CFD analysis, the flowfield can be easily converted to a variety of other formats for infrared radiation(IR), ultra-violet(UV), or visible spectral analysis, for radiation transport or scene generation softwares. Converters are also available for analysis using DSMC codes, and radar cross section codes . If IR predictions are not desired, RPFM also includes a visualization package to quickly view CFD results for analyzing solutions. The RPFM software as been validated against a wide range of missile systems over the last 10 years, providing a robust tool for many missile system applications. A quality assurance(QA) matrix performs over 280 missile plume signatures prior to every release to improve the user experience. RPFM’s QA matrix tests the entire plume flowfield from the missile nose to the end of the plume for altitudes ranging from sea level static cases to 250km altitudes for a variety of conditions from liquid and solid systems. Additionally, conversions and simulations for the most common radiative transport codes are performed to assure a good user experience with partner software packages. Contact UsFor more information or to try out the software. If you are a current user you can find the latest release, version 5.5.0 at fileshare.craft-tech.com. Support is available out of our Pipersville or Huntsville offices.